Universal Studios was the first venue to open. Serving up entertainment and thrill rides from television and movies, it has something for everyone. The little ones have their own area that includes Barney Live on stage, a pint size roller coaster, and a water and ball factory. For the movie enthusiasts there are really great movie themed rides such as Men in Black, Disaster, Revenge of the Mummy, Terminator 2 3d, Twister and Transformer. The kids also have the own themed movie rides (that adults also like0 such as Despicable Me Minion Mayhem, E.T. Adventure, Kang & Kudos’ Twirls n Hurl, Shrek 4D. The Simpsons Ride and the Woody Woodpecker Nuthouse Coaster.. 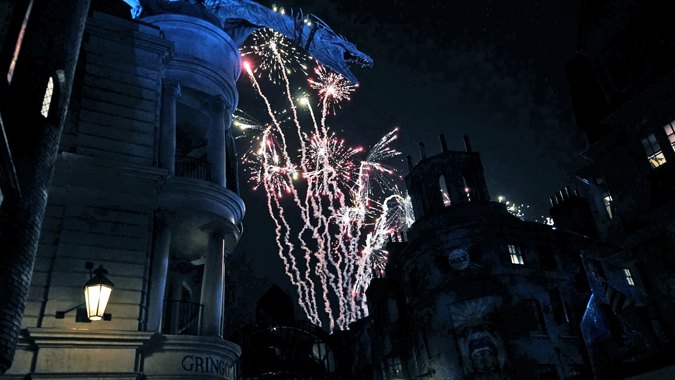 The more recent movie attraction and in fact whole new component of the park is the Wizarding world of Harry Potter – Diagon Alley where shops and food and even a fire-breathing dragon entertain you. It is a large park (as is all Orlando area attractions) which means there is a lot of walking to do. For those who could benefit from mobility assistance or just want to conserve energy for their nighttime entertainments, Orlando scooter rentals are welcomed. To rent a scooter, mobility scooter, electric wheelchair, electronic convenience vehicle, ECV, for Universal Studios all you need to do is make a reservation either online or by telephone and it will be delivered to your hotel, resort, timeshare, villa direct or even campground. Scooter Vacations is the only company that offers six different scooter models to choose from (and three will fit in a car trunk with a weight capacity of up to 450 Lbs and our luxury models handle up to 550 Lbs. With lightweight yet sturdy designed and advanced engineered to provide 12-15 hours of daily theme park use battery power scooters make Scooter Vacations the number one luxury mobility scooter rental company serving Universal Studios and all venues in Orlando. Ensure you have the best for your Orlando Florida Universal Studios vacation. Mobility: Our electric wheelchairs (ECVs) are self-propelled so you won’t need to rely on others to assist you. Wheelchair weight restrictions: Universal’s wheelchairs have weight restrictions (about 350 pounds). Our electric scooters can facilitate more weight and the batteries last all day. Wheelchair availability: Universal Orlando wheelchairs are available on a first-come, first serve basis. On busy days, they sell out. Book an electric scooter with Scooter Vacations and we guarantee availability. Park Hopping: If you plan on park hopping (visiting parks other than Universal in the same day), you’ll need to return your wheelchair and rent a new wheelchair at each park if you rent from that park. Rent from Scooter Vacations and your scooter stays with you all day! How does my rental scooter get delivered to me at Universal Studios? Except in pre-arranged, specific needs cases, scooters are delivered to where you are staying and you transport them with you to Universal.